The community news website I’ve run for the last five years, A Little Bit of Stone, is taking part in a research project run by Nesta’s Destination Local programme, along with nine other UK ‘hyperlocal’ operations. Between now and February, the participants will each explore how a more strategic use of website and social media analytics might help them define and measure their success online, improve their service, audience engagement and reach, and, in turn, their sustainability and legacy within their local community. Development and dissemination of learning resources for long-term benefit of and use by the wider hyperlocal media sector. Nesta’s Destination Local research showed that hyperlocal sites aren’t utilising the power of audience analytics – A Little Bit of Stone certainly hasn’t, mainly through a lack of technical knowledge and failure to understand the importance of audience analytics. 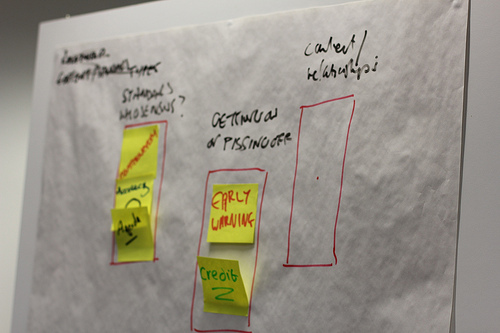 The project kicked off on Friday with a training workshop at Nesta’s HQ in London. Below is a bit of a brain dump of ideas, thoughts, tips and links from the day. Dave Harte from Birmingham City University, and Bournville Blog, gave an overview of the UK hyperlocal sector from his research findings. Really interesting stuff and you can see his slides HERE, including some useful figures on people’s consumption of hyperlocal news. The growth of mobile has been phenomenal over the last few years, with consumption of news online becoming mobile first. Websites that don’t work on mobile are pretty quickly going to be ignored by Google. Naturally, advertising spend is increasingly going mobile too. Alex Kozloff and Mike Reynolds from the Internet Advertising Bureau (IAB) – the UK trade association for digital advertising – said the spend on digital advertising in 2014 was £7.2 billion – with mobile making up 22% of this (up 63% in just one year and forecast to be half of digital advertising spend pretty soon. Pretty amazing considering it was just above 1% only five years ago). Most digital advertising is paid search (52%), with 32% coming in display advertising, be that banners, content and native advertising, online video, social banner etc. Interestingly, the infuriating ‘interruptive’ advertising used prominently on regional newspaper websites only makes up 1% of the digital display ad spend. Mark Brill gave a great snapshot of how to make sure your hyperlocal site is primed for mobile. It’s always seemed like the dark art of the internet to me, SEO, so it was wonderful to have a run-through of some of its elements from Chris Unitt. Chris stressed the importance of getting site visitors’ email addresses (recommended the SumoMe WordPress plugin) and of asking questions of visitors, as well as having strong, highly visible calls to action and social sharing buttons on posts. Chris also talked us through analytics. With analytics, you have a number of reporting needs, internal and external. Only go in to the analytics and find the data that you need when you know what you want to look for, and why you’re looking for it. What question do you need to answer. A good line from the BBC’s guide to analytics – “We should not become slaves to analytics. Data should inform what we do; not tell us what to do”. The BBC Academy has some great stuff on analytics HERE by the way. Google have free online analytics courses through their Analytics Academy. Chris also talked about the usefulness of surveys and polls on hyperlocal sites and recommended the YOP Poll plugin. On top of all the call to arms about mobile and SEO/analytics on the day was a great presentation from Abhay Adjikari on digital identity. He talked about the concept of ‘post-demographic consumerism’ – building audiences on the basis of shared values. With any online project, he said, always start with ‘people’ before ‘content’. 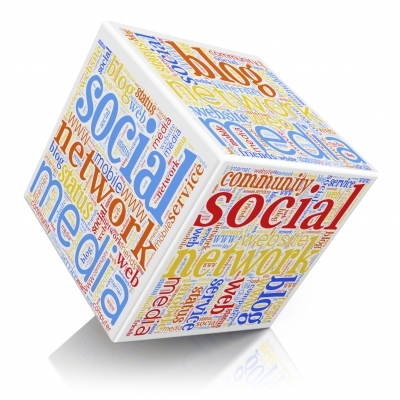 What people do you want to attract to your site? What conversations do you want to have? Don’t try to speak to everyone in a community, he recommends. It’s OK to specialise and to speak to smaller, more defined audiences. What happens next with the Nesta project? I have to do at least four self-assigned experiments with audience analytics over the project period, at least one each month basically, and provide Nesta with raw data. I’ll be thinking about the first experiment, to be completed in October, over the next few days. So much to digest and think about! I went along to the meet-up at the BBC’s West Midlands HQ in The Mailbox, Birmingham, last night. Organised by Nick Booth from Podnosh, who’s been doing a lot of work with helping the Beeb to engage with hyperlocal websites, it was a chance for bloggers to chat to producers, reporters and managers from the BBC. It shows how far the hyperlocal movement has come – and how much the BBC wants to engage – that such an event has come about. So a big thank you to Nick for making this happen. It also says great things about the hyperlocal community here in the West Midlands. 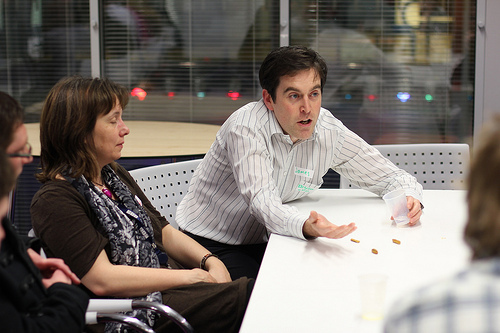 The event followed the unconference format, with people suggesting topics or areas they wanted to discuss. There was a pretty wide range of stuff. I suggested a chat about how the BBC could credit hyperlocal sites if they used their stories – and it turned into a really interesting debate. I’d been pretty miffed a few days before the meet-up about one of my stories on A Little Bit of Stone being picked up by a BBC Radio Stoke reporter. I felt they should at least have let me know they’d done this or acknowledged my site in some way (more of which later). The producer of The Politics Show (sorry, I can’t remember his name) made the point that hyperlocal bloggers are now the layer of local, on-the-ground reporters that the traditional media used to have. I think this is certainly the case. But if that’s so, and the BBC and local newspapers are using this layer of reporting to bolster and add to their coverage, or simply to monitor what’s going on in their patch, there has to be some form of recognition and credit. Doesn’t there? Hyperlocals are doing great things in their communities. But if all they are to the traditional media is a big pond in which they can dip, that doesn’t seem right. He asked where the chain of credit should end. If, for instance, a reporter picked up on an interesting story or topic from the Telegraph, should that be credited in their story? It’s an interesting point. My response was that different rules should apply to those volunteers who spend their own time reporting local news. The point was also made about when a hyperlocal site becomes ‘competition’. The Politics Show producer positively bristled when talking about Pits n Pots and Six Towns Radio in Stoke-on-Trent, which has attracted a huge audience with its no-nonsense coverage of local issues in a very challenging political environment (it was a shame that Mike Rawlins from Pits n Pots was sat at another table having a different debate. I hope they managed to have a chat!). The traditional journalist’s instinct is always about exclusives and beating the competition – and rightly so. But when hyperlocals get a bit too big for their boots, I don’t think the BBC – or any traditional media – will be too keen on crediting or acknowledging them. Laura Ellis, the head of new media for the English regions, said that BBC reporters who used hyperlocal stories as the basis for their own reports should be acknowledging this. She made the great point that reporters could perhaps make a comment on the original story on the hyperlocal site. I think this is a really good point. As a matter of courtesy, a reporter – in my opinion – should get in touch if they’re using one of my stories. The local newspapers in my area are pretty good at this. David Elks at The Sentinel always lets me know if he’s passed something on to the newsdesk. Another weekly paper has used my photographs, but always with a credit. My experience of local BBC reporters is that it doesn’t happen. The point was made several times that it’s all about relationships. But it’s hardly a good start to a relationship if a local BBC reporter takes a story from my site with no contact, no acknowledgement and no courtesy. I hope this will change. And I’ll certainly be trying to meet up with the local BBC reporter in my area to build more of a relationship. Someone from Shropshire Live (I really am rubbish at remembering names) talked about the great relationship they have with BBC Shropshire. He knows many of the reporters and producers from his time in local radio and the relationship sounded incredibly productive. Philip John from The Lichfield Blog also spoke about the Birmingham Mail’s reciprocal arrangement with hyperlocal blogs, a model that the BBC could do well to explore and replicate. So, were there any breakthroughs or positives in the debate? It was pretty clear that this is the start of the conversation but it was very pleasing that the BBC in the West Midlands is reaching out and engaging. Laura Ellis suggested that the BBC, when covering a story online, could approach hyperlocal bloggers in the area – especially if it’s a big story – to add another level of local detail and coverage. It was acknowledged that hyperlocal sites have a tremendous amount of engagement with their communities, a two-way dialogue that traditional media just can’t reach any more. It will be interesting to see if this idea develops. Another suggestion from Laura was the BBC’s links to external news providers. 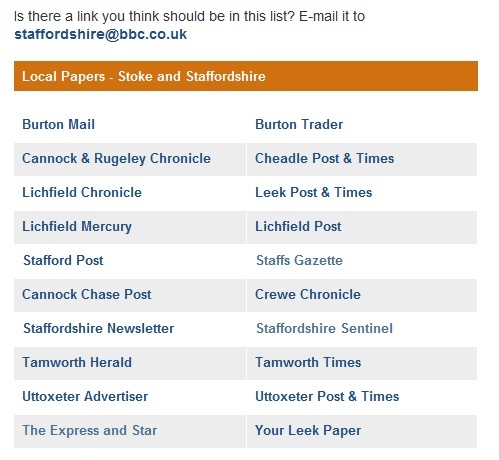 BBC online for the regions is now part of the news operation and all the regional sites, like Stoke & Staffordshire, have links to other media in the area – surely hyperlocal sites could and should be listed here? Hyperlocals should be approaching the regional sites and asking to be included. There’s a contact email address at the top of each list. I mailed last week to see if A Little Bit of Stone could be included – still waiting to hear back. … an aggregator of local stories from other sources, using Moreover. It sounds like the Beeb are having a few problems with this, mainly because of advertisements slipping through, but it’s another way that hyperlocals could be included in the BBC news machine. It’s been really interesting to see lots of thought over the last couple of days on spreading the word about UKGovCamp, and the unconference idea in general. Is there a danger, some attendees have asked, that we’re only really speaking to the converted at these things, however far the virtual word spreads via blogs, Flickr tags and the like. I was mulling this over on the train home on Saturday night and comparing UKGovCamp with another event I’d attended just the day before, an LG Communications’ seminar in Nottingham about social media. The line-up of speakers was stellar, including Will Perrin, Dan Slee, Michelle Ide-Smith and Ally Hook, and it was a really positive day. There were lots of local government people, all at different stages on the digital communications journey, all wanting to learn how to do things better. There wasn’t an avalanche of tweets from this event, unlike UKGovCamp, mainly because the majority of local government comms people there are taking their first steps into the world of digital. But they were at the event. They ‘get’ the idea of social media and digital comms. And, whatever barriers they face back at the office, they really want to do something about it. They’re exactly the kind of people who should be at unconferences. So how to get them there? 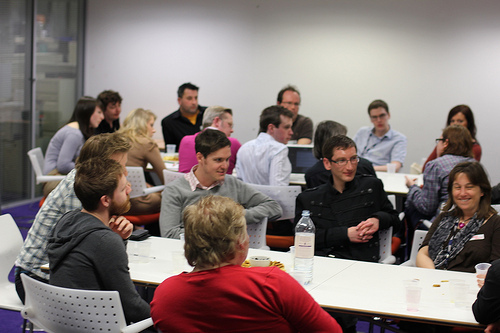 At UKGovCamp itself, and over the last couple of days, some encouraging things have happened which may help. On Monday, in a brilliant move, plans were swiftly put in place for a BigLocalGovCamp in Birmingham, in June. Even more brilliant was the idea that attendees should bring along a colleague, someone who would really benefit from the experience. It was a fantastic idea from Carl Haggerty. 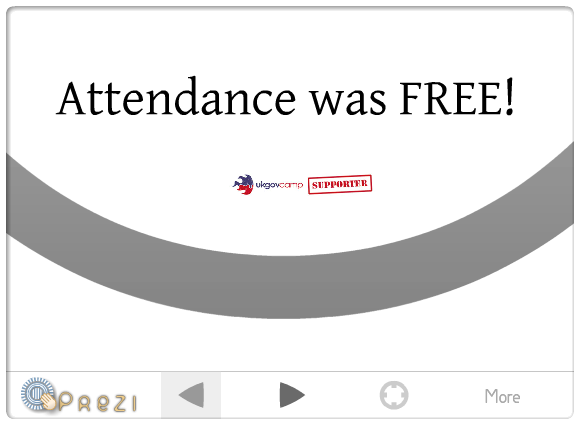 Also on Monday, Liz Azyan produced a brilliant Prezi presentation specifically aimed at people who weren’t at UKGovCamp. It summarises what the event was all about, the major topics that were discussed and what some of the attendees thought about it. It’s top notch and I’ve sent a link to all my comms colleagues at my council. You should do the same. 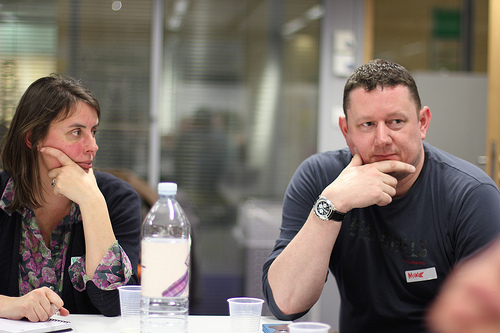 At UKGovCamp on Saturday, meanwhile, the brilliant Andy Mabbett from Birmingham announced that a Birmingham Tea Camp would soon be up and running, very much along the lines of a regular event in London. The idea is simple. People meet up in a cafe, drink tea and talk about epic stuff. Ace. I’ll definitely be going along – and encouraging my colleagues to do the same. It’s probably indicative of the confidence of the unconference community, and the huge success of UKGovCamp 2011, that much of the focus of the early post-event scheming and wheezing is about getting more people involved. To convert the unconverted. It’s been a strange old weekend as a hyperlocal blogger. I spent Saturday at the excellent UKGovCamp at Microsoft HQ in London, an amazing gathering of central gov / local gov heroes who are all trying to make things better using new technology.But as often happens as a hyperlocal blogger, the world of the blog often intrudes into every other facet of your life, including the day job. I started getting texts, tweets, emails and Facebook messages at about lunchtime telling me that, apparently, a body had been found on a supermarket car park in the town.To be honest, I was way too busy squeezing every drop out of the event to even consider attempting to post anything on A Little Bit Of Stone. As tempting as it was, I didn’t want to be calling police voicebanks or out-of-hours ambulance service press officers. So I let it go. What was most disconcerting and worrying was the fact there was nothing online about what had happened. 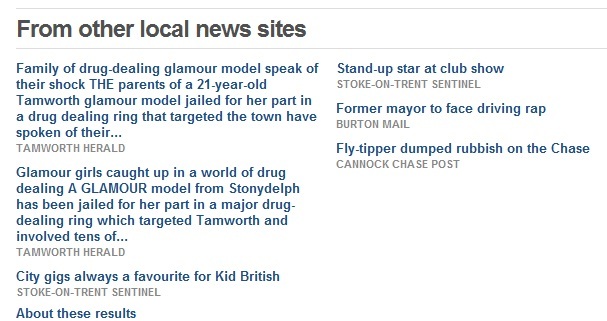 Nothing on the emergency service websites, nothing on any of the local newspapers’ sites, nothing on the Beeb. A total silence. Which was increasingly being filled by speculation and rumour on Facebook and by word of mouth. By the Sunday morning, dozens and dozens of people had already been searching on the site using such terms as ‘murder’ and ‘body found’. A call to the ambulance service out-of-hours press officer and a quick call to the police automated newsline gave me enough information to post this at 10.30am this morning. As I type this – almost 12 hours later at 10.15pm – more than 600 people have read that post. There are 14,000 people living in Stone. What have I learned from this? And why am I feeling so angry? Firstly, it has made me even more committed to A Little Bit Of Stone and the gap that it can fill in a town like Stone.The police newsline message was posted just after noon on Saturday – why there’s nothing online about the incident apart from my blog just beggars belief. Shrinking workforces at local papers means that incidents like this on a weekend just slip through the net until Monday morning. A real information and communication vacuum was created this weekend. Information was provided by the emergency services but this was not taken up by the traditional media and their online platforms. And the emergency services’ communications teams were obviously unable to get anything out online to reassure the community here in Stone. All of this just isn’t good enough.